Samuel Hoffman | The Journal Gazette Logan Atkinson, 13, grabs air as he competes in the intermediate event at the Fort Wayne Indoor Skatepark on Saturday. Skateboarders and BMX riders have come from around the Midwest to the facility. When the weather gets cold and winter approaches, zipping around on a concrete skatepark gets chilly. Saturday, a nonprofit called Fort Wayne Indoor Skatepark brought the sport indoors for the season, holding a Thanksgiving skateboard contest with prizes supplied by California skateboard companies Independent Truck and Creature Skateboards. 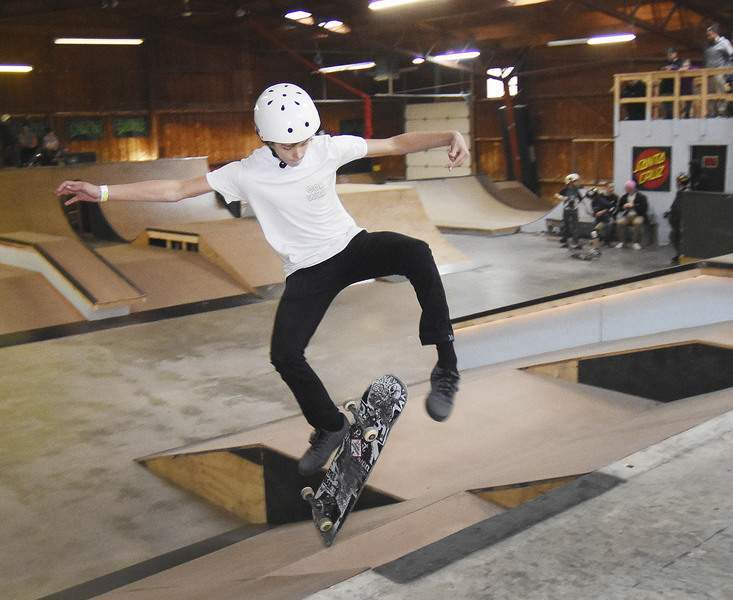 The indoor park, located at 3054 E. State Blvd., has been in operation for about three years, but it recently completely rebuilt its layout to accommodate both boards and BMX bikes, which are banned at the outdoor park on Fourth Street. "It’s completely new," said co-owner Rich Hoppe. "Places like this are super rare," said Hoppe, meaning the park is serving as a regional hub for skaters and BMX bikers. "We don’t make any money. It’s all volunteer." The park is also unusual in that it only operates in the winter, opening for the season in early November. It will remain open until around April. There are alternative places to skate in the summer, plus the indoor building just gets too hot, Hoppe said. Hoppe said about 40 percent of the park’s revenue comes from donations and 60 percent from admission fees. The closest indoor skate park that can accommodate bikes and boards is in Cleveland, Hoppe said. "They have somewhere to go now," and people have come from Michigan, Indiana, Ohio and Kentucky to skate here. But it was competition time Saturday, and among the people planning to enter the contest was Jackson Coats, a 14-year-old who screams up and down the ramps phenomenally fast and doesn’t even think of falling. His skating is controlled chaos, Hoppe said. Coats’ goal Saturday was simple – to win. Then there was Austin Curry, 21, half again as tall as Coats but whose skating is just as hair-raising. Curry has gone to some huge tournaments around the country, but he couldn’t compete Saturday. He had to go to work. He likes having the indoor park because it’s convenient and it helps him stay sharp. All in all, about 25 skaters were expected to compete, and when it was over Hoppe expected plenty of other skaters shy of the limelight of competition, possibly because they’re in their 40s now, would turn out and skate.